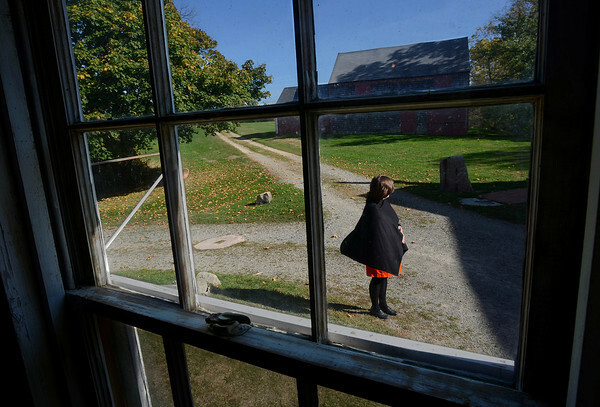 Kristen Weiss, site manager of Cogwell's Grant in Essex, looks out Monday over the historic 18th-century farm on Spring Street in Essex. Tours of the house have just ended for another year, but the season's grand finale will be this coming Saturday, when Cogswell's Grant hosts a Pumpkin Day celebration. The event, from 11 a.m. to 4 p.m., will feature hay wagon rides through the fields, jack-o'-lantern carving, a pumpkin pie-eating contest, crafts, games and apple cider pressing. Pumpkin pie and hot mulled apple cider will be served. Admission will be $6 for adults, $4 for children 3 to 12, and free to Historic New England members and children under 3. For more information, visit HistoricNewEngland.org.